New Year’s Day ramblers braved the weather and raised £165! 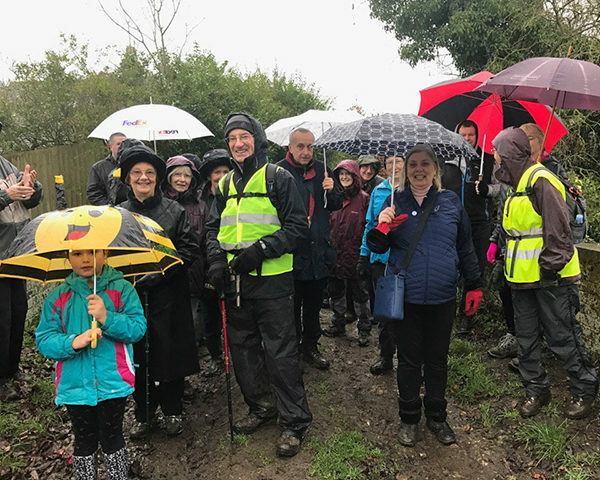 Ramblers walked the Thame Boundary on New Years Day with the Mayor, Cllr Linda Emery, to raise funds for Red Kite and Thame Youth Projects. This community walk has been very popular with previous Mayors. The walk began at St Mary’s Church where 36 friends and families shook off their Christmas cobwebs and took up the 4 mile challenge. The atmosphere was charged with enthusiasm and the heavy rain was ignored. Walkers included members of the Ramblers Association, Rotarian’s, Inner Wheel, Lions, Councillors and families. An impressive £165 was raised. Walkers shared hot soup, tea and coffee at Racquets Fitness Club at the end of the event. The participants expressed keenness for the Boundary Walk to become an annual event. The Mayor Linda Emery would like to thank all those who participated in the event and made it so enjoyable. The Mayor will be holding lots of events in 2017 in support of her charities, including a screening of the film Bridget Jones’s Baby and a Charity Golf Day. For more information and to donate to the Mayor’s charities, please click here.